This is an old article. Find an updated version (2016) here. From Scotland to Japan via Ireland and Wales, there’s a whole world of whisky to discover, and London has just the bars for the job. Albannach NOTE: this has now closed. Set right on Trafalgar Square, this grand Scottish-themed bar and restaurant lays claim to having the best selection of single malts “in the UK, if not the world”. We couldn’t verify that, but with a list split into different Scottish regions that runs into the several hundreds, they may well be right. If you’re after something specific and special (and willing to pay for it) Albannach is a good bet of where to find it. What we really like here, though, is the sets of ‘whisky flights’ that are ideal for those unsure what to order, or wanting to discover more about what different whiskies taste like. Starting at £10 and going up £25, there’s a host of three-to-five-strong whisky selections that have been put together to show off the spirit’s diversity: try a tour of Scotland’s regions, a set of some of the most classic malts, or a tasting trip around the world. A proper Camden institution and staple of any night out in the area, this American fun-time bar, restaurant and live music venue excels itself when it comes to Bourbon and Tennessee whisky. There’s over eighty Bourbons alone to choose from, before you even get started on the other stuff. And, of course, you could also have them slung in a cocktail or drizzled into a milkshake, should you feel so inclined. The list is a serious one, but there’s nothing else about this bar that takes itself too seriously at all. Home to all things Scottish in London, the Boisdale brand now extends to three sites in Belgravia, Bishopsgate and Canary Wharf. It’s the latter which boasts not only the most impressive space (read: it’s frickin’ massive) but also the greatest whisky selection. The list stretches to an incredible one thousand plus bottles, of which the vast majority are Scottish (although Irish and Japanese options can also be found). Prices range from just over £7 to around £100 for 50ml measures of some rarities. Boisdale knows its audience, and if you’re drinking the more common stuff you’re likely to be able to find it cheaper elsewhere; if it’s something unusual you’re after, or you want maximum choice, then there’s no doubting that this is the place to go. There’s a tendency for bars specialising in whisky in London to lean to the stuffy side, probably not least because by its very nature a few drinks can very quickly start to add up. That’s what makes this place so refreshing. An unglossy old boozer on a quiet back street near Borough, it might not be where you’d expect to find a stellar whisky lineup, but there are well over a hundred offerings on the cramped back-bar. If you go regularly, you’ll also appreciate the ‘malt of the month’ providing a constantly changing dram of something a little special. Reasonably priced whiskies (there’s plenty of doubles for little over a fiver), a pleasant terrace and a laid-back atmosphere combine to create a true London gem; albeit not that hidden a gem, judging by how busy it can get around end of work time. On the third floor above Fitzrovia’s Chinese and pan-Asian restaurant Bam-bou is this tranquil and seductive bar dedicated to Japanese whisky. Whisky experts will readily admit that Japan is now producing whisky that’s on a par with the Scottish originals, and many of the finest can be found here, along with some rare and pricey editions. You can see the full selection of around seventy different varieties online here, it can boast being among the biggest selections of Japanese whisky outside of Japan itself. Set just off eclectic Edgware road, there’s no getting away from the fact that Salt is weird. From its clubby, neon-signed exterior and its anything-but-salt-of-the-earth long shiny bar through to its inexplicable combination of Indian dishes, shisha and whisky. We won’t even go into the fact that there are also burgers and falafel on the menu. But it’s the whisky we’re talking about here, and Salt has no fewer than one hundred and eighty (cue darts voice) of them from around the world, including England, Ireland, Wales, India, Canada and Japan as well as American bourbon and Scotch. We like the menu’s descriptive tasting notes, while prices are modest for some of the straight-up spirits, and there’s a fairly decent selection of whisky-based cocktails to lure you in, too. Just don’t expect the best bar atmosphere you’ve ever experienced. The St. Pancras Grand Champagne bar is a well known piece of concourse chic, frequented by travellers indulging in a swift sip of France’s local juice before boarding the Eurostar to take them closer to it. This more recently opened whisky bar opposite is less discussed, but an impressive spot offering over fifty whiskies from Scotland and beyond. The menu has been put together with input (and dosh, no doubt) from Johnnie Walker, so the brand naturally features heavily but far from dominates. It’s not the cheapest whisky hit you’ll find, but an impressive space nonetheless, especially if you manage to catch one of the live jazz sessions. It deserves to be more than a train station pit-stop. Tucked beneath Soho yakitori restaurant Bincho, it won’t be a surprise to hear that this bar doesn’t much care for Scottish whisky. What it does have is a selection of more than forty-five Japanese whiskies, just slightly fewer than at Bam-bou’s Red Bar. What it has more of is atmosphere, with a slightly younger, louder crowd tending to come here, and prices are a tad lower as well. That there are some whisky cocktails to be had and food in the form of skewers courtesy of the restaurant upstairs are further points in its favour. 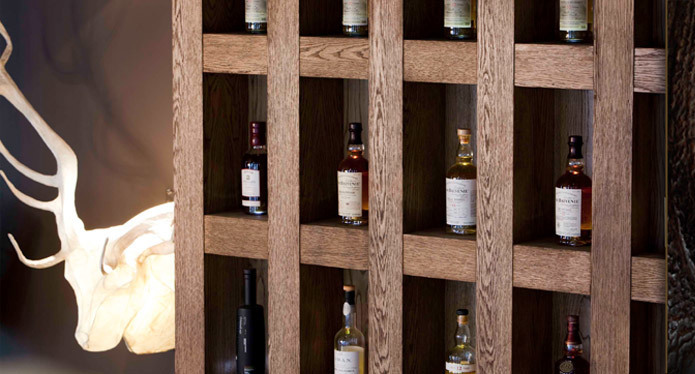 The list of whiskies at this plush Mayfair hotel is over three hundred-strong and growing. The bar even has its own whisky sommelier. It doesn’t come cheap, though. This Upper Street dive bar-styled venue with bras hanging from the ceiling has a surprisingly good selection of Bourbons and American whiskies considering its laid-back good time vibes. It sounds like serious stuff, and it is. You have to be a member to visit, hence it didn’t make the grade for our main selection, but if you do get in you will be treated to “the largest selection of single cask, single malt whisky in the world”. Impressive. Set above the excellent The Vintage House whisky and other spirits shop is this members’ club with more than 400 different whiskies from around the world. Once again, it’s members only unfortunately.